TunerFreeMCE, a longtime favorite Windows Media Center plugin, has made the leap from WMC to the Windows Store as TunerFree. TunerFree collects on-demand content from a variety of sources, including BBC iPlayer, ITV, Hulu, NASA TV, and BBC Radio. 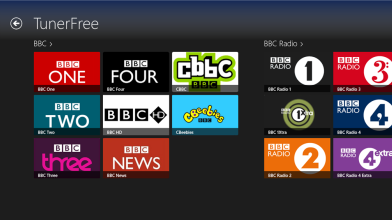 As an American, the only BBC content I could reliably access through TunerFreeMCE was BBC Radio, but part of the beauty of TunerFreeMCE was the ability to select the specific content sources you wanted to include in the interface, a feature that the Windows Store app has brought over. TunerFree is available for free from the Windows Store. For for a long time TunerFreeMCE has been the best addin for bringing on demand TV into Windows Media Center with out the need for a TV Tuner (hence the name). Martin Millmore the developer of TunerFree has brought the app to the Windows Store, bringing TV to Windows 8 and Windows RT.